This song is too good, I had to buy it. OOF for ROBLOXians on iTunes like me lol. Keep doing you Kanye. All these fkn crybaby millenial B's don't know what time it is. 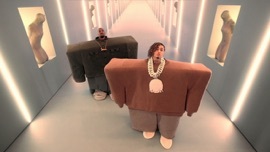 Honestly, I hate both Kanye and Lil Pump, but this videos so funny and the song is so catchy even if it’s stupid. Love the ROBLOX look...keep it up. Another example Of how terrible the music is today. Kanye you are not innovative. Stop! Just stop!